The film does leave those intending to deliver a spoiler free review in a bind. The writing is super clever but I hesitate to share much of it at all at the expense of ruining some of the puzzle box secrets built into the story. So instead let's fall back to a brief overview of what's going on. The centerpiece of the movie revolves around a family reunion in the countryside. Parents celebrating their 35th anniversary are gathering adult children (and significant others) to their beautiful, spacious and isolated vacation home. Which would be wonderful if the film's opening scene hasn't gorily setup the background that there was a psycho killer on the loose murdering folks with a machete and scrawling "You're Next" in large letters, using their blood as ink. So we know things aren't going to go especially well ... and they certainly do not. The opening sequence is shot as a tribute to 80's era slasher films. The look is lush and off and sexual all at the same time making it nigh impossible not to be drawn in. But it's definitely familiar and I couldn't help but wonder about having see this sort of thing too many times before. Wingard's cinematic sleight of hand lulls one into the belief that they're about to watch a well shot but thoroughly ordinary flick about a violent home invasion nutcase. Even the younger women being killed half naked and post coitus is familiar for the genre. But this bit of misdirection hides the fact that You're Next will soon winningly twist its knife in ways you weren't expecting. Even as opening scene anchors the first few bars of the picture's only soundtrack which will soon be used in ways that are insidiously clever. This might be a good time to point out that You're Next is not for everyone. Personally I'm not particularly interested in horror films and I'll admit to be easily scared. 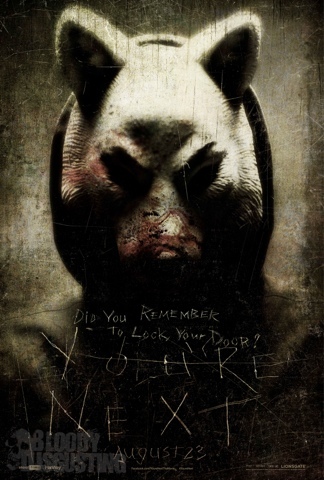 But I still loved You're next. It's worth mentioning directly that while I laughed out loud repeatedly during the screening this is in fact a bloody, tense and often disturbing (for some) film. Which is another way of saying that while it's funny this ain't Tucker and Dale vs Evil. Getting back to our happy family .... They're not especially happy. That suspicion is raised early on and then solidified over dinner. The brothers are at each other's throat (making way for an especially entertaining performance by director Joe Swanberg), some appear to have substance abuse issues and it's not entirely clear that this is going to be a bump free family reunion. Yet no one is expecting masked intruders to burst upon the scene. Intruders with no agenda other than murdering everyone in sight. Which delightfully doesn't really bring an end to the bickering - most notably with two brothers having what seems like a well trod argument over who is the better runner, and thus the one who should try to make it to an outside phone. At this point genre filmmaking has conditioned us to expect people to die bloodily, attempt to fight back, probably make some dumb mistakes, but perish in a blaze of entertaining glory. But it turns out one of the guest has a set of skills that comes in particularly handy in such situations. As the story unfurls there are more than enough plot twists and turns to keep mentally engaged while the bloody catharsis spools out at a breakneck pace. Standard relationship concerns such as "you never want to try new things" yield retorts such as " .. I don't think that's a fair criticism under the circumstances" which perhaps have never been more true in the history of cinema. The visual and verbal storytelling is sharply executed. The ensemble cast is terrific. With actress Sharni Vinson being a perfect fit to the entire endeavor. Not to mention the clear Miss December of any gorgeous women with hot accents and an ax calendar. Plus it's fun to see Ti West get shot in the head with an arrow. Oops, maybe a spoiler there. But this is a slasher film at its core. And one of the few giveaways in a remarkably spoiler free trailer. You'll laugh, you'll shudder, you'll marvel at the skill of what the filmmakers and cast have wrought. And if you're like me you'll giddily wait for the much teased moment proving that Chekhov's gun is sometimes really an ax tied above a doorway,which is definitely gonna cut someone by the time the night it through. All in all a piece of disgustingly beautiful violent art that deserves it's largest honor to date - the painting of a tribute mural on the wall of the former South Lamar Alamo Drafthouse theater. That may be gone but I'm are a large number of accolades await You're Next 2+ years after playing at Fantastic Fest. Sometimes you just need a night out to laugh, cringe and enjoy a bloody catharsis. I did need such a thing and You're Next delivered. Bravo! Good review Rich. It's a very fun horror flick. Actually, probably more that, then actually scary, but hey, I'll take a good time over a boring time any night of the week.